IdentoGO is proud to introduce our Birth Certify service to our TSA Pre✓® , HAZMAT and TWIC customers. Birth Certify service allows our agents to retrieve birth records for citizenship verification during the enrollment process for our federal programs in the Universal Enroll Service (UES). In the case a customer has only an approved government issued photo ID available for enrollment, the UES system may be able to electronically verify with the customer’s state of birth that a birth record is on file. Prices for this service vary by state, are only available for specific states and birth years, and can only be used for our federal programs. You will not receive a hard copy of your Birth Certify; however, the Birth Certify will be stored in the customer’s UES record to use for any UES service within 1 year of initial certification for enrollments in which a birth certificate is a required document. Please note the eligibility requirement below. To be eligible for the Birth Certify service, you must meet the following basic eligibility requirements. Do you have a government issued photo Id? Do you know the proper spelling of your mothers maiden name? Do you know the exact spelling of your name on your original birth certificate? The dates shown represent the specific time-frames the state is able to certify birth records. 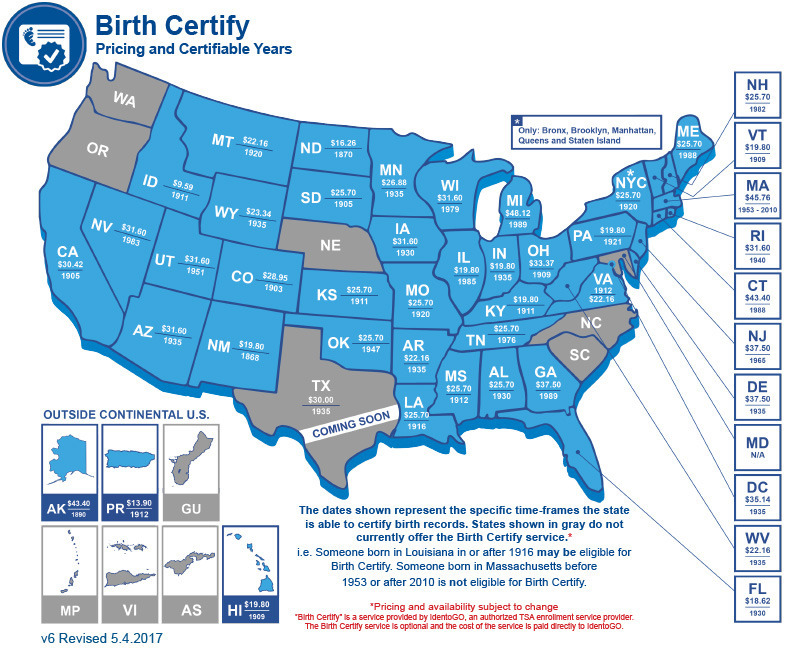 States shown in Gray do not currently offer Birth Certify Service. *Pricing and availability subject to change. Can’t find your Birth Certificate? IdentoGO can help you obtain a copy of your official birth certificate and have it mailed directly to you!